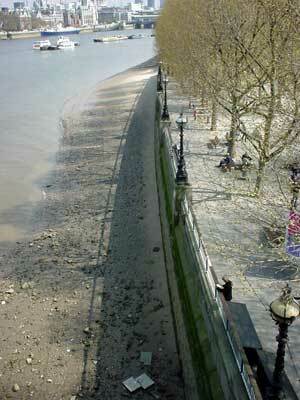 A view of the Thames at low tide from Waterloo Bridge. A 1956 survey found that the Thames was biologically dead with no breeding fish population and the river a health hazard. Thankfully, a hugely successful campaign has seen the river stage a remarkable comeback, with over a hundred species of fish now being recorded in the tidal Thames estuary. So it's safe to take a lovely walk along the beach at low tide!